Alto Mail is an email client that organizes all your mail accounts in one place, so you can find what you need even faster. Beyond the typical inbox display, Alto provides organizational tools that automatically highlight important information so you can find what you need when you need it. Email used to be simple. Now, we’re faced with a flood of messages arriving in multiple inboxes. It’s getting harder to manage, creating more stress than it relieves. Introducing Alto Mail, the app that knows the context and surfaces relevant things you need in your everyday life from your email. 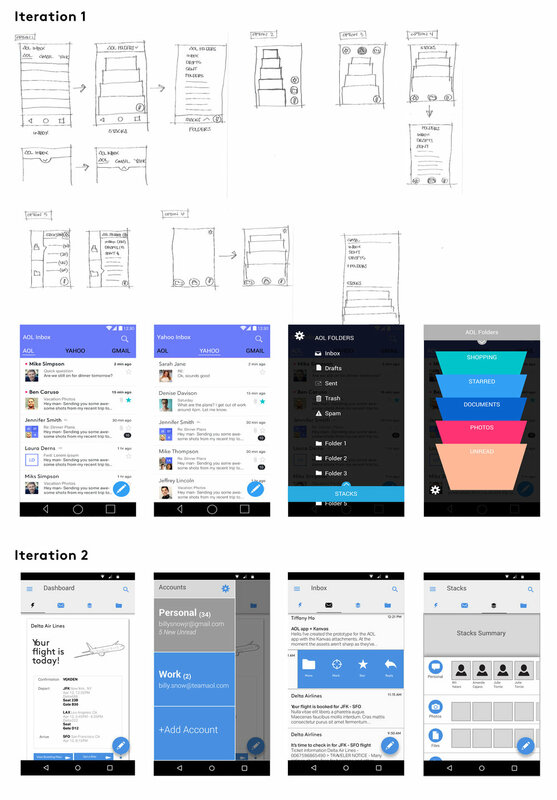 The design process had to be tackled in a systematic way because the four key features — Account Aggregation, Account Collections, Stacks, and Cards — of the product played into each other to create a unified experience. I would start on one while considering the other three and go through cycles and sprints. There were a lot of paper sketches, pin-ups/white boarding with discussions and critiques. 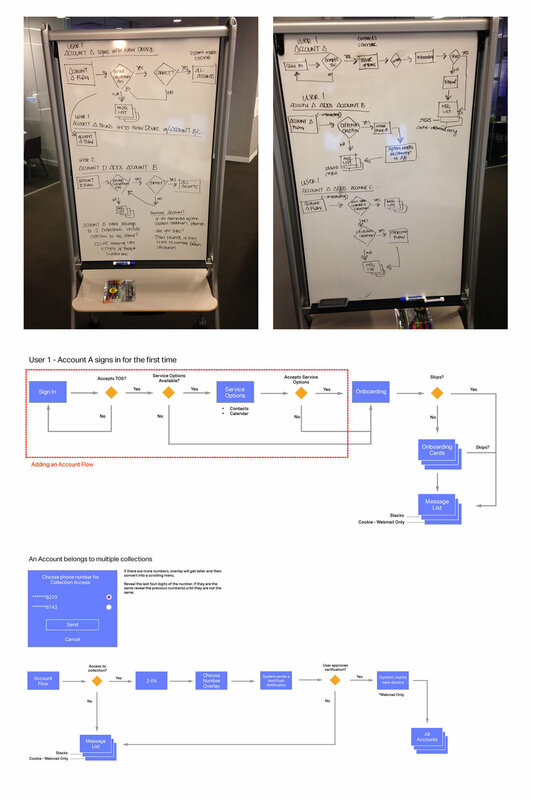 After many rounds of iteration and guerilla testing, we managed to get buy in from Design, Product, and Engineering leadership for an MVP that launched in July 2015. Sr UX Designer - I led all of the UX work, user research, concepting, detailed wires and the design phases for the Alto brand that launched in July 2015. Facilitated a discussion on what Alto Mail was to us at the point of release and where we saw it going with the 5 W's & H (Who, What, When, Where, Why, & How). 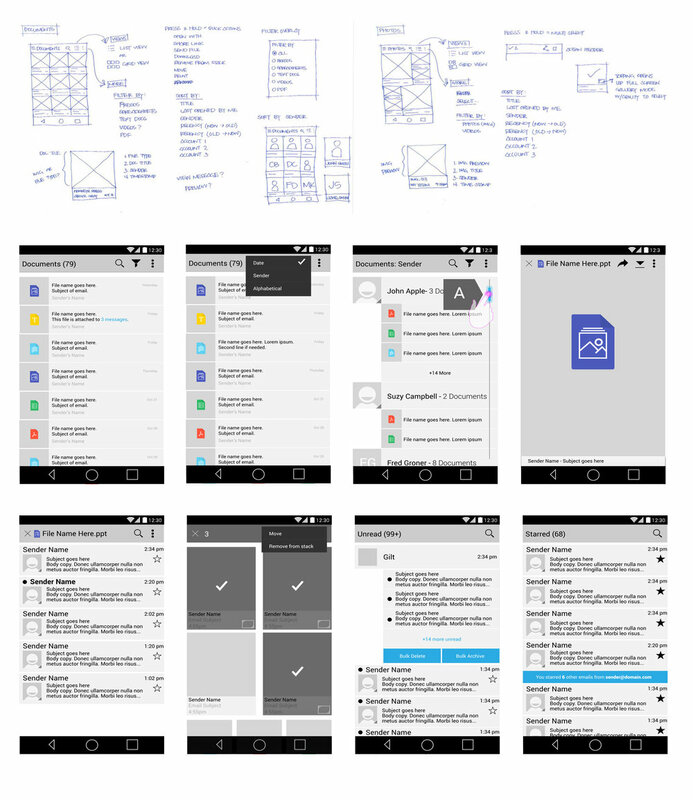 I sketched through many iterations of how navigation would function between accounts, stacks and folders. After each iteration, we did a round of guerrilla testing around our office to get a general feeling of what was expected. Part of the selling features of Alto is Account Collections. This allows a User to make a collection of all their email accounts on one device and be able to move to another device, enter credentials for any one of those accounts and through a secure flow, get access to the others without entering each accounts credentials. Leveraging OAuth 2 flow. Stacks are certain views or categories of your mail. There are nine system generated stacks: Personal, Photos, Files, Unread, Starred, Finance, Shopping, Travel and Social. These filter or extract key components from your mail to provide you with faster ways of consuming viewing your email. Cards are high-level representations of email that allows you to digest faster without having to open and read your mail. We currently provide seven versions of cards: Flights, Trains, Hotel Reservations, Car Reservations, Restaurant Reservations, Shopping/Shipping, and Event Reservations. In July 2015, I led the first round of internal user testing of the Alto Mail product before we publicly launched in beta to ensure we were delivering the most optimal and usable product. We performed five tests and consolidated our findings as a design team. I synthesized all results and findings and presented this back to our Executive and Senior team in order to move forward with the needed changes. Email used to be simple. Now, we’re faced with a flood of messages arriving in multiple inboxes. It’s getting harder to manage, creating more stress than it relieves. Video created by Wii Yatani.